Breathable 2" wide elastic laminated with 3M™ Scotchlite™ Reflective Material that returns 500 candlepower retro-reflectivity and features a tri-glide adjuster. Reflective Elastic is 48 inches long and stretches to over 7 feet. The best belt for active wear requiring 360° day and night visibility, this 1.5" wide breathable elastic belt features a quick release buckle and is laminated with 3M™ Scotchlite™ Reflective Material that gives back 500 candlepower retro-reflectivity. It easily adjusts from 28" to 48" and can stretch up to 9 feet for multiple uses, or to wrap around gear. The Re-Flex Extended Elastic Belt with buckle is made with breathable stretch elastic for comfort and laminated with 3M™ Scotchlite™ Reflective material that returns 500 candlepower reflectivity. Adjusts from 29" to 52"
Made with breathable stretch elastic for comfort and laminated with 3M™ Scotchlite™ Reflective Material that returns 500 candlepower retro-reflectivity. Re-Flex® Extended Elastic Belt with 2" wide shoulder sash for additional reflectivity and safety. Made of 3M™ Scotchlite™ Reflective Material that returns 500 candlepower retro-reflectivity. Features a quick release belt buckle for easy use. Our sashes adjust to fit most sizes. 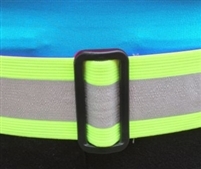 Extended reflective belt with quick-release buckle. Has three 10" adjustable flags.